Positive training that positively works! When puppies are first born the only thing motivating them is self preservation. Instinctive urges cause them to crawl towards warmth. Fixed motor patterns cause them to paw at teats when hunger motivates them to feed. At this stage the pups are not social animals. Far from it. Evoultion has given them a genetic predisposition to become social but there is a process the pup must go through in order to fulfill this potential. This process is called socialisation. The clue is in the name! It is only through the process of interacting with it’s siblings and parent/s that the pups will grow to be fully functioning, social adults. The pups very quickly start to initiate aggressive interactions, sometimes over resources but at times it appears to be for no reason at all. It may be over proximity to something too abstract for us to observe but these fights can be very rough. They are rough because what we are seeing is real aggression and real fear and real pain. It is through this process that the pups learn about bite inhibition, their ability to inflict and receive pain and more importantly their ability to placate the aggressor through their posture and vocal communication. They also learn to cease hostilities on seeing these appeasing and submissive gestures. Through this process the pups are learning the art of being social. The ability to get and maintain resources by posturing and communication alone and the ability to acknowledge others dominant behaviour and show submissive behaviour in response, safe in the knowledge this will work. Through repeated encounters the pups will start to recognize when they are likely to win an encounter with a sibling or not and will not invest energy wasting their time. We then tend to describe those individuals as ‘dominant’ or ‘submissive’ but we must remember that dominance and submission are behaviour traits not character traits and are subject to change depending on social circumstance. The aim of dominance/submission is to prevent aggression and provide a stable environment for the dogs to live. In the dogs ancestor the wolf, family life is largely harmonious. Most encounters can be dealt with through communication and conflict is avoided through dominant/submissive posturing. Even when fighting does break out it is very ritualised and rarely causes injury. So far the pup has only encountered members of its own family. If we want our pup to be social with strange dogs when out on walks etc then the process of socialisation needs to continue to include new, stra nge dogs. These dogs should include the many types of dog around from the very big to the very small. It is worth making the effort to meet dogs that look very different from the pup as well. Dogs with longer coats or shorter coats, ears pricked or floppy, pointed faces and flat faces. There is even scope for adding in different species too. Dogs, humans, cats, goats. There is no limit but it has to happen within the socialisation period. This is generally the first 12 weeks of life although constant encounters are required to ensure the highest levels of socialisation. Although aggression plays a part in the very early stages of socialisation it does not follow that it plays any real part in forming or maintaining adult relationships. Much of the unwavering dominant behaviour the pups have seen comes from the parents who must naturally adopt a leadership role. This leadership role is a given from parents to offspring as the young are so dependant upon them and learning the rules of life from them. Us humans can maintain our ‘dominant’ position merely by adopting the leadership role. 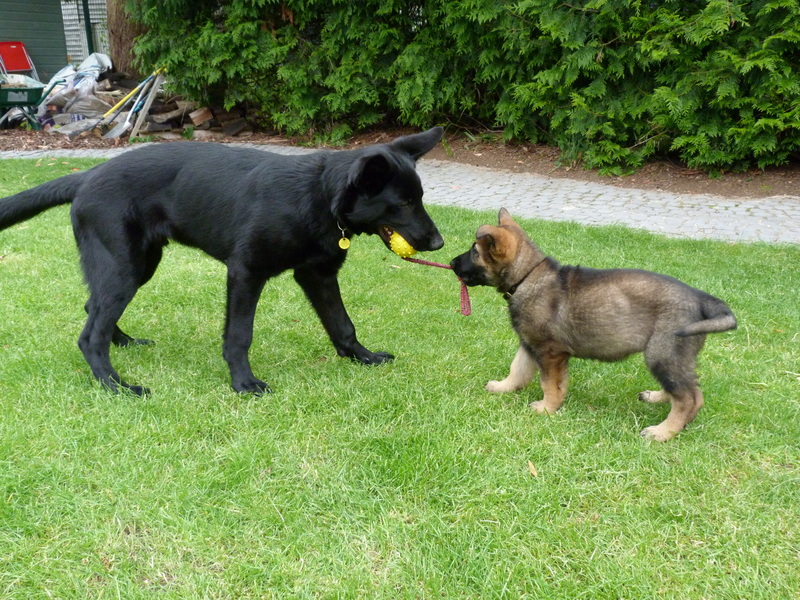 By teaching our dogs the rules and enforcing them consistently we can avoid conflict. There is no requirement to be aggressive or to use physical reprimands. If we remember that dominance is a mechanism for overcoming aggression then if we see actual aggression it should tell us not that the dog is being dominant (and trying to take over the universe) but that something is going wrong. That is the subject for another post though. 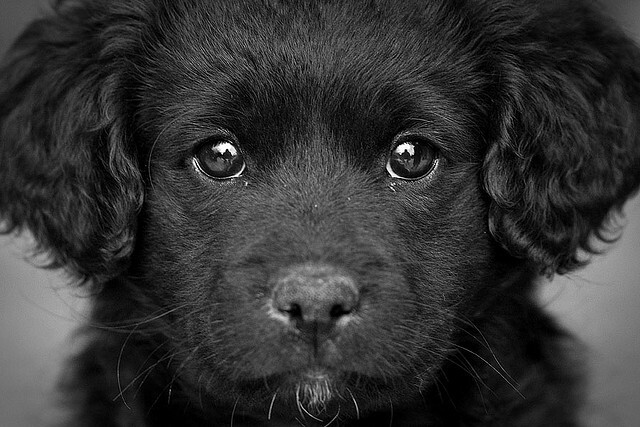 If you have a puppy or are getting one soon just remember that to be social the dog will need to be socialised. This is your responsibility and although you may suffer the consequences of a poorly socialised dog in the short term, it is the dog that will pay in the long run, often with his life. What is dominance in dogs? The debate has never been more lively. How do you deal with a dominant dog? How do you prevent dominance? Should I use physical punishment to deal with and prevent dominance? People are entitled to their own view I agree. But, when their view causes other beings unnecessary suffering as a result of actioning their beliefs then I believe other members of society have a moral obligation to take action. Part of the action I have chosen to take is to try and help people make sense of all the scientific data available. They are then in a better position to make an informed choice. Some will still choose a given course of action despite evidence to the contrary but most people appear to be trying to do the right thing by their dogs. There are many fields of science and all are relevant but for this article I will concentrate on the ethological viewpoint in an attempt to explain what dominance is and how best to deal with it. This looks at all aspects of an animal from its biological make up, to its environment and the way these elements impact on the individuals behaviour. The tendency is to look at things within the bigger picture rather than in isolation. Here is my take on it all in a nutshell. All life is part of one big family tree. The single goal for any life form is survival in order to reproduce. Through evolutionary change, life forms have found many strategies for life. Evolution has seen life forms increase in complexity from single cell replicators to the most complex life form of all:- man. Aggression is a drive aimed at eliminating competition. Competition is anything that poses a threat to the individuals ability to stay alive and reproduce. Some life forms have found sociability to be a useful strategy. In order to become social, species need to develop mechanisms for overcoming aggression. These strategies include ritualised behaviours. Sociability ranges from herding and flocking to highly complex co-operative structures. Social animals are born with a genetic potential for sociability. To become social they must be socialized during a critical period at the beginning of their life. Missing this socialization period serious reduces the individuals capacity for sociability. Many complex social structures rely on dominance hierarchies for social stability. Wolves live in such a structure. Dominance is social aggression. The aim is to win an encounter rather than eliminate the competitor by use of ‘actual’ aggression..
Submission is social fear. The aim is to signal acceptance of defeat in the encounter rather than motivate flight or fight as with ‘actual’ fear. Dominance and submission are behavioural traits not character traits. In a group structure the individual who wins more encounters may be described as the ‘dominant’ male. Individuals who lose more encounters may be described as submissive. It is important to recognize that dominance/submission are behaviours not character traits. As such any given individual placed in a different setting may display different behaviour. Wolves live primarily in family groups. The dominant animals are often the breeding pair. They are normally the parents of the other wolves and as such have adopted this role through necessity. Leadership is an important component of the ‘dominant’ role. Young dogs submit to their parents and conflict is avoided through ritualisation etc. Forming territories is one way of avoiding conflict with other wolves (competition). Fighting is dangerous as it poses a threat to the individuals and therefore avoiding fighting is an effective evolutionary strategy. As young wolves grow up, conflicts may become more common as they push to get their own needs met. This conflict may lead to the potential for actual aggression which in turn leads to the individual leaving the pack. This submissive young wolf will then potentially form a pack of his own where he will become the dominant male. Wolves outside the family unit are met with ‘actual’ aggression not dominance. They pose a threat to the pack through direct competition for food, mates etc. The motivation for aggression is to eliminate the competition. Dominance in wolves is not gained through conflict. It’s purpose is to avoid conflict and provide a stable strategy for life. Most studies show domestic dogs do not form packs as wolves do. Dominance in dogs is the same as it is in wolves. It is a way of dealing with conflict within a social context. Dealing with dominant behaviour with punitive methods is as likely to escalate the situation as solve it. If a dog could be described as dominant within its household then there is a serious issue with leadership which is a fundamental component of the dominant role. The implementation of household rules will go a long way to resolving many of the issues. Individual learned behaviours such as food guarding can be best dealt with by counter conditioning. Through selective breeding by man, dog behaviour has been drastically altered from the blue print of the wolf. Dogs have the genetic potential to be social with people and dogs well beyond the family unit. 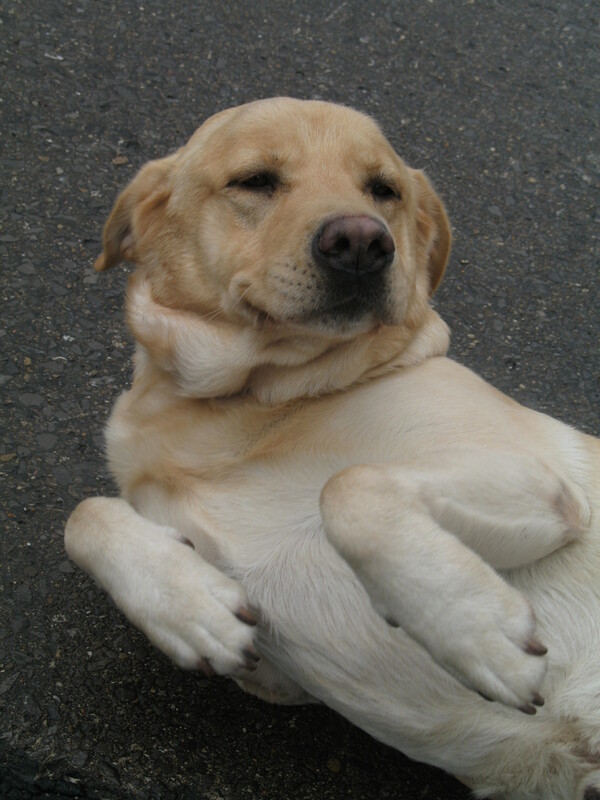 As a result, dominant and submissive behaviours may be seen between dogs that are strangers. Actual aggression may also be seen in dogs that are not sufficiently socialised and between individuals when neither yields. The main problem facing dog owners is that they have been fed misinformation for decades. Studies of unrelated captive wolves showed a strict linear dominace hierarchy whereby the biggest, strongest wolves won encounters by aggression and asserting themselves with aggressive displays. It was wrongly interpreted that this is how wolves maintain the top position. Therefore this is how owners must treat their dogs. The assumption is that dogs are always pushing to become dominant and showing them who’s boss with your own aggressive displays is how you keep them in check. It couldn’t be further from the truth. Dogs. like wolves are programmed to to avoid conflict. They are highly social and if you lead they will follow. 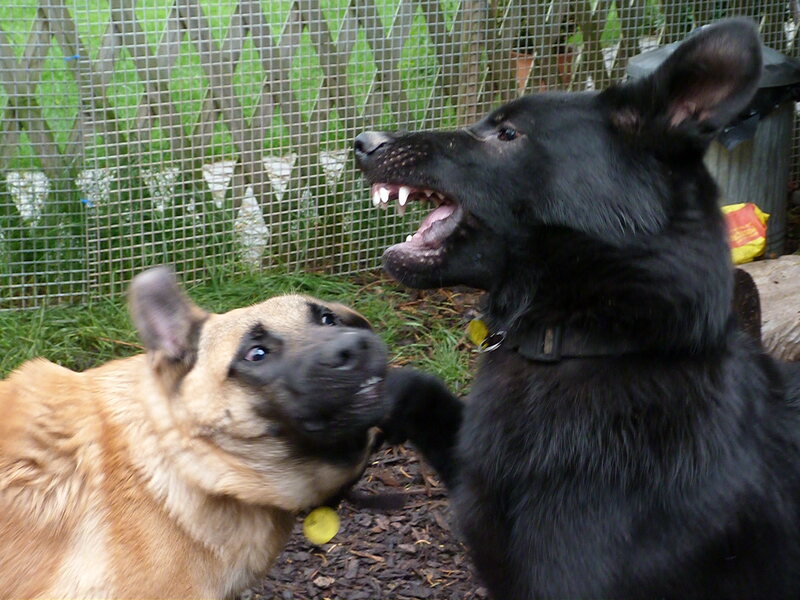 Many of the techniques often recomended to reduce and deal with dominant dogs such as alpha rolling, scruffing etc are confrontational and potentially damaging to your relationship with your dog. For those of us working with dogs that are trained to bite and defend themselves, these techniques are especially dangerous and I know of numerous handlers and dogs who have been casualties of this misguided approach to dog training. If you would like to read more on this subject then I would recomend “on Aggression” by Konrad Lorenz and “The evolution of canine social behaviour” by Roger Abrantes. Puppy. Day 3. Brothers reunited.